In BAFTA this morning then back again for Film Committee tonight and today it is absolutely jumping with household names and familiar faces (no, obviously I can't photograph them - BAFTA is that rare thing for celebrities, a private space). Everyone meeting here today seem to be planning new projects - certainly they are all getting animated / excited / loud! So much energy! So many good ideas. . . 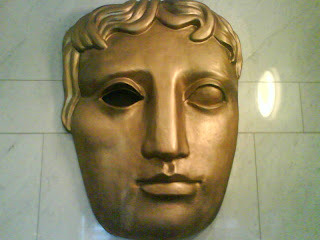 But BAFTA has only been like this since the furniture and food were made less formal - more grazing and relaxed chatting these days has transformed it as a work space for the Creative Industries. As creativity becomes more central to the curriculum we need to learn from successes like this, and include it in the design of learning spaces.. . .
Dear Prof, Heppell: I met you in Banff...actually on the streets of Banff...I congratulated you right after your talk! Thank you...you are an amazing person...you are a model that I intend to follow.